We need a new, biblical blueprint for revival and awakening. Whether the church likes it or not, things are shifting. The spiritual atmosphere over the nations of the earth is changing. Darkness is undeniably getting darker, causing some Christians to withdraw from the earth and prepare for an immediate escape. Though we are to love the soon-coming appearance of the Lord (2 Tim. 4:8), and eagerly await His Parousia, there is a great harvest to reap for the kingdom. Many focus on the increasing advancement of darkness, dwelling on a more dismal eschatology where the world ultimately culminates in apocalyptic disaster. While there are certainly signs of encroaching darkness, the church also needs to pay close attention to other "signs of the times." We often get so focused on end-times speculation that we neglect our stewardship of the massive Holy Spirit outpouring that is taking place before our very eyes! This is why I am so thrilled about the release of Jennifer LeClaire's timely new book, The Next Great Move of God. It was my absolute honor to offer a small contribution to this landmark work, as LeClaire introduces you to God's expansive supernatural movement throughout the earth, offering a multitude of different perspectives—from Billy Graham to Dutch Sheets, from Reinhard Bonnke to Jonathan Cahn—on what the Holy Spirit is presently doing and saying. Across the denominational spectrum, there is emerging a great hunger and great hope. One collective voice is rising in the midst of darkness, making an appeal to heaven that the lost would be saved, prodigals would come home, that normal Christianity would be restored, and that the miraculous would one again follow the bold proclamation of the gospel. How Did the Apostle Paul Pray for Revival? When considering a fresh perspective on revival, I cannot help but think of how the Apostle Paul uniquely encouraged believers to pray for spiritual outpouring. Recently, I asked myself the question: How often did the apostle Paul pray for revival? The answer might shock you: He didn't pray for revival once throughout the New Testament ... at least not the way we are used to praying for it. In the same way that Paul didn't give us templates for quick-fix prayers (how often do we see Paul asking God to completely extract him from difficult circumstances or shield him from adversity? ), the pioneering apostolic voice of the New Testament never mentioned revival. And yet, I believe the prayers that Paul gives us are some of the most necessary and powerful when it comes to unleashing the supernatural standard of Christianity that the church should be walking in. So, what do we do with the fact that Paul didn't pray for revival? How does this impact our revival theology today? How Did Jesus Pray for Revival? We answer the Paul question by taking a step further and asking the question: How did Jesus pray for revival? After all, one could also conclude that Jesus never talked about revival either. Really though, did Jesus, the Apostle Paul or the early church community need what we often define as "revival?" No. Revival was normal Christianity for them. One definition of revival, as proposed by Dr. Michael Brown, is that it is a "return to normal." Jesus didn't need revival because He lived, breathed and modeled normal Christianity. Everything that normally accompanies revival—preaching of repentance, demonstration of the kingdom, signs, wonders, deliverance, healing and salvation, family reconciliation, restoration of the backslidden and prodigals—followed Jesus' ministry as the norm, not the exception. The same was true for the Apostle Paul ... and the early church for about the first 300 years of Christianity. Then something shifted ... and we have been recovering from that shift ever since. This is why we need revival and need to pay attention to how the Holy Spirit is moving in the world right now. The church became highly politicized and exchanged supernatural power for popularity and worldly influence. It became socially acceptable to become a Christian, thus making it easy for people to become "casual believers." The house of God became identified more as an opulent building or cathedral than a redeemed human temple. The miracles, signs and wonders that followed Jesus and the early believers became exclusively reserved for remarkable, superior saints who proved themselves exceptional above their peers. The "normal" people were either directed to shrines to receive healing prayer or were discouraged altogether from praying for miracles, since sickness and torment became signs of sanctification. The Christian cosmology shifted from a "warfare" model—one that saw the church as anointed and empowered to advance God's kingdom on Earth, overthrowing opposing demonic spiritual forces—to a "blueprint" view, where everything that happened in life was the result of "God's sovereign will." Would the Awakened Church Please Stand Up? "I will give you the keys of the kingdom of heaven; and whatever you bind on earth shall have been bound in heaven, and whatever you loose on earth shall have been loosed in heaven" (Matt. 16:19, NASB). Where is the church that Jesus introduced—one that forbids the advancement of darkness, while partnering with the Holy Spirit to unlock God's Kingdom? She is here, right now, on the earth. Unfortunately, the very community that has been given keys of authority to unlock Heaven and bind hell is all too often a people living in a perpetual identity crisis, in desperate need of awakening. Yet, there is stirring. A rumbling is being felt in the spirit realm. An appeal to heaven is being offered up from voices on the earth. It may be a few voices spread out in different cities and regions throughout the world, but their cries are part of a great intercessory concert that is coming into agreement with the purposes of heaven. The church is being awakened. This is what Paul called us to pray for—not just when things get really bad, but all the time. Seems to me that he was more interested in sustaining a supernatural lifestyle than pursuing an electric spiritual jolt every so often. So how did the Apostle Paul pray for revival? "I pray that the eyes of your heart may be enlightened in order that you may know the hope to which he has called you, the riches of his glorious inheritance in his holy people" (Eph. 1:18, NIV). He prayed for opened, enlightened eyes. How is this important? Rather than calling some new outpouring of God down from heaven, the church needs to become awakened to the priceless inheritance that she has already received in the Person of the Holy Spirit. I'm convinced that a vital part of the next great move of God will involve the awakening of God's people to every single grace Jesus' blood made accessible to the church. It's not about convincing God to give us something new; it's about repenting for not stewarding the riches that the precious blood of Christ has given us legal, biblical access to. We're not begging God for anything; we're awakening to what it realty looks like to be a Christ-follower, nation-discipler and kingdom ambassador. If you want to have a better understanding of how the Holy Spirit is moving right now—and you long to partner with Him in participating in this next great move of God, I encourage you to pick up Jennifer's book, The Next Great Move of God. More than just another book to buy, you are reading a roadmap to revival that will give you insights from different generals of the faith on how to experience personal awakening that ultimately leads to Great Awakening in the church and reformation throughout the earth. Larry Sparks is author of the book Breakthrough Faith: Living a Life Where Anything Is Possible, and co-author of the upcoming book The Fire That Never Sleeps, with Dr. Michael Brown and John Kilpatrick (June 16). 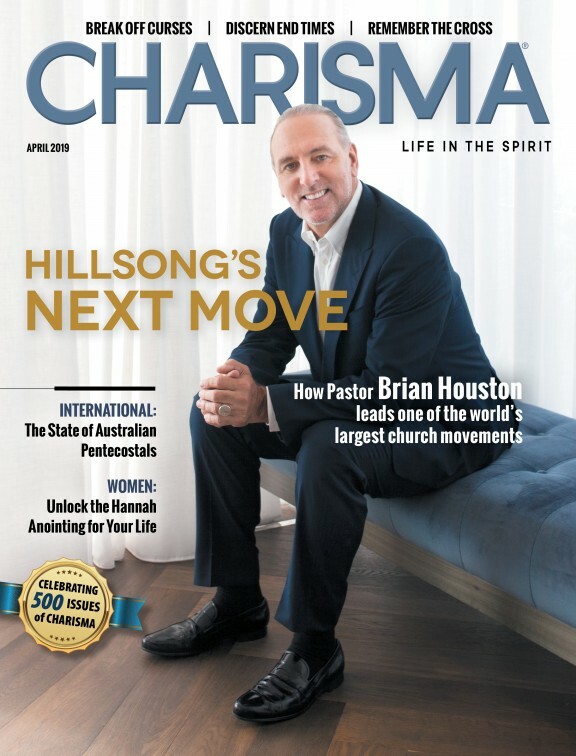 Larry is a columnist for Charisma, teacher and revivalist who is committed to training the body of Christ through three key seminars: 1) Sustaining a Lifestyle of Revival, 2) Revival in Media, and 3) Breakthrough Faith. Featured on CBN, TBN, and Sid Roth's It's Supernatural, Larry is passionate about raising up communities who usher in regional revival and awakening. You can visit his website at lawrencesparks.com. Also, you can "like" Larry on Facebook (LarryVSparks) and Twitter (@LarryVSparks) to receive empowerment keys to experience and sustain a revival lifestyle.